Protect your laptop with a stylish and lightweight design, the 15.4" Rolling Laptop Case from Targus®. The closed cell foam padding keeps your Laptop protected while the durable/water resistant 1200D polyester material keeps belongings dry in wet weather. Suitable for 15.4-inch laptops, this case provides you with an easily accessible zip-down workstation which includes pen loops, a business card holder, zippered pocket, cell phone pocket and large pouch to store additional accessories. 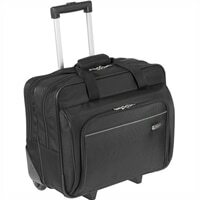 It also includes a large zippered compartment to store office essentials or clothing for overnight trips. With telescoping handle that retracts into a zippered compartment and dual carry handle, this ergonomically designed Laptop case forms travelling companion for professionals on the go. Fits Laptops with Screen Size Up to 15.4"